Russell Means, the most well-known American Indian leader today, travelled with his wife, Gloria, for Ginés' painting exhibition in Mexico in 1992. In a very moving speech, Means said that the "strength and beauty of Ginés' art is not born of the Western world but from his deep experience with the American Indians. "Months after the speech, the Lakota (Sioux) Chief made history by adopting Gines as his brother. It was the first time in centuries that a Lakota Chief adopted a Spaniard as his kin. Ginés was also honored by being chosen the godfather of Natani Inez, Russell and Gloria's youngest son. Their friendship dates back to 1981. Means then invited Gines to the Yellow Thunder Camp, a sacred Indian land in "his nation," Black Hills, South Dakota. Ginés took part in sacred ceremonies: Sacred Pipe, Inipi, Give Away, Sun Dance. 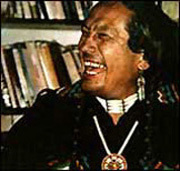 After his stay, Ginés' New York City Village apartment became the headquarters of the American Indian Movement (AIM) leaders: Russell Means, Floyd Westerman, Ivonne, Bill Wahpepah, Bill Means, Tony Gonzales, Winona LaDuque, Peggy Burnett, Glen Morris, among others. Through the years Ginés committed himself to defend the human rights of indigenous groups. He worked, wrote and lectured world-wide, intensively, on the social and human conditions of the Indian people in the United States and Latin-America. Ginés became a Consultant to the United Nations (UNFPA) advising on issues related to indigenous people, creating projects to improve the health conditions and to reduce infant mortality in one hundred Indian villages. Years later he denounced government and United Nations officials of corruption. Remembering some of their adventures, Ginés recalled: "We often laughed and had a great time, but I had an argument with Russ once while we were in San Sebastian, Spain. We were invited to lecture at the Basque Television and University. Back in the hotel, Russ told me, "Come on, Ginés, you are more than my friend, you are my brother. Brothers also fight." Russell Means became also a renowned actor, starring in films like "The Last of the Mohicans," and as the voice of Chief Powhatan in "Pocahontas.